Canine Behavior – What Should I Do When My Dog Growls? A dog that growls is not a bad dog. 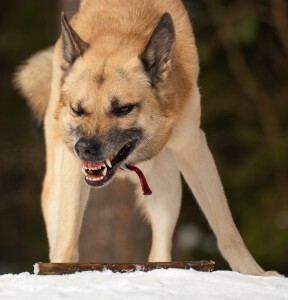 While a dog’s growl can be frightening and disheartening, it also serves the very useful purpose of alerting us or another being that the dog is feeling threatened, uncomfortable or angry. It is the dog’s way of saying “If something in this situation does not change, I may have no other choice except to bite.” Growling is a communication tool that is designed to increase the distance between the dog and that which the dog perceives as a threat. While a growl is usually associated with “aggression”, it is important to understand that there are many causes of aggression. Pain or other medical issues can cause an aggressive response, as can fear. Fear arises for many reasons; a reminder of a previous negative experience, a perceived loss of a resource or space, expectations of punishment and associated pain, and maternal protective instincts can all cause a dog to react “aggressively”. Sexual competition, barrier frustration, low tolerance for frustration, differences in personalities between dogs, and genetics may also cause or contribute to aggressive behavior. As a certified dog behavior consultant (CDBC) I deal with a greater number of aggressive dogs than the average person. I appreciate it when a client’s dog growls thus giving me a warning and an opportunity to change my behavior so I do not get bitten. For this reason, I advise all my clients and students that it is NEVER wise to punish a dog for growling; even saying “No” or looking at the dog crossly can constitute punishment. Dogs that are repeatedly punished for growling eventually may not give warning and immediately escalate to biting. A dog that has learned not to growl due to punishment is far more dangerous than a dog that will give a warning growl before escalating to biting. These dogs will also be much more difficult to rehabilitate. If your dog is in a situation where they growl; as calmly as possible step back and assess the circumstances surrounding the growling. If possible, ask whatever is causing your dog to remain still and to increase the distance away from your dog. Keeping safety foremost in your mind, and with as little fanfare and emotion as possible, call your dog back to you or if they are on leash get them to follow you as you back away from the situation to a place where they will feel safe and secure. Your dog will pick-up on your emotions and if they sense you are upset, angry or afraid your dog is likely to become more reactive. Do not keep your dog in a stressful situation and try to reassure them or yell at them for growling, neither is likely to be helpful. Once you have ensured the safety of all parties, you need to try to determine what caused your dog to feel threatened and defensive in the first place. To keep you and your dog safe, you should make sure that they are on a short leash, nothing longer than 6 feet, in any similar situations in the future. If your dog is growling frequently, or growling is very out of character for your dog, you should schedule a veterinary exam to rule out any physical causes such as pain or illness. If the growling and aggression are not due to medical reasons it is time to seek a consultation with a credentialed and experienced dog behavior consultant to work with you in resolving your dog’s behavior. The sooner you seek guidance the better. Aggression rarely improves without intervention and the more times it occurs, the more likely it is to reoccur and the longer it will take to resolve. It is important to understand that obedience training alone is extremely unlikely to resolve an aggression issue. Training certain behaviors like “Look” and “Leave It” may be useful in managing your dog when they are reactive, but will not change the way your dog is feeling. Aggression is an emotional response, sometimes due to a feeling of having no control over a situation. Sitting and staying for you on cue does not afford the dog a sense of control and may actually increase their fear and the accompanying response. Imagine how you would feel if you were afraid of bees and someone forced you to sit in a room full of bees until you “got over it.” I think you’d agree that would only make you more reactive and afraid. In order to resolve aggression, we need to change the dog’s emotions. This is most commonly accomplished through a program of behavior modification and may include the use of medications prescribed by your veterinarian as well as complementary remedies, such as Bach Flower remedies, selected by a qualified practitioner. Aggression will seldom go away on its own and the longer you wait, the harder it is to resolve. Dogs grow into aggression, not out of it. If you are having concerns, the time to seek help is now.